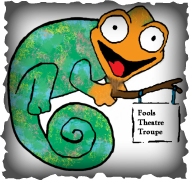 We are the Chameleon Fools Theatre Troupe! 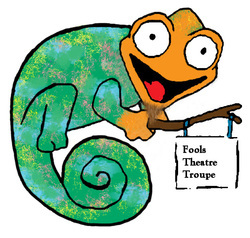 • Our Mission: The Chameleon Fools Theatre Troupe is dedicated to producing a community of artists free to create, play, and hone their craft through developing new projects, exploring historic styles, and constantly adapting works for new audiences, while providing educational outreach to children of all backgrounds and levels of experience. ​• Our Vision: To inspire, nurture, challenge, and engage the arts community for a vibrant and well-versed human collective. • Our Values: We believe in exploring new ideas and generating discussions both on and off the stage through our work. Nathan Autrey -- Co-Founder, Artistic Director. He is a graduate of The University of North Texas with a B.F.A. specialized in Acting and Directing. His passions in the theatre primarily focus on directing, but he also considers himself interested in producing, teaching, designing and acting. He also has a strong love specifically for Irish Theatre therefore, while in school, He spent a semester abroad studying theatre in Northern Ireland at the University of Ulster. While there, he studied directing under a pupil of Pinter. His other directing influences were based in the work of Grotowski. While working with Broken Gears, he was awarded with a top ten production in 2010, John Patrick Shanley’s Danny and the Deep Blue Sea and a US premiere of The Magdalene Whitewash, featuring a talk back with the playwright Valerie Goodwin. As well as, nominations from John Garcia’s: The Column for best direction and numerous positive theatrical reviews within the top Dallas Fort-Worth area publications. For the past 8 years, he has served as a high school Theatre Director. He helped construct k-12 Theatre curriculum for both Irving ISD and Carrollton Farmers Branch ISD. He is also, a certified University Interscholastic League Drama Adjudicator for the state of Texas, One Act Play competition. He currently serves as an Artistic Associate for the non-profit theatre company Stolen Shakespeare Guild, based out of Fort-Worth and as well, acts as an honorary member of the Board of Directors at Casa Manana Regional Theatre. As of now, he is finishing up his first year as an MFA Directing Student at the Actors Studio Drama School at Pace University. Zane A. Whitney Jr -- Co-Founder, Producing Director. Besides being the Co-Founder and Producing Director for CFTT, Zane is also an actor, director, workshop instructor, and lighting and sound designer. He holds a Professional Training Program Certificate from Dell’Arte International School of Physical Theatre, as well as a BFA in Theatre with an emphasis in Performance from Stephen F. Austin State University. His favorite roles include: Dipshit the stagehand in Commedia Brigadoon, the French Taunter/Tim the Enchanter/Herbert’s Father in Spamalot, the Clown in The Winter’s Tale, Lou Daniels in Tribute, among many others. Zane is a member of the Society of American Fight Directors and the Association of Theatre Movement Educators. Head on over to the workshop page and see what workshops he has to offer, and if interested feel free to contact him through the contact us page. Sarah Whitney -- Education Outreach Director. She holds a Bachelor of Fine Arts in Performing from Stephen F. Austin State University, and has studied theatre styles in both London and Barcelona. In London at Rose Bruford College she studied Greek theater, French theater, Grotowski, Dario Fo, Staniewski, and Meyerhold. In Barcelona at the Institut Del Teatre she studied under Joan Baxies, puppetry, object manipulation, voice, and acting. Some of her Favorite roles include: Helena: All's Well that Ends Well, Susan: The Heidi Chronicles, Joan Go'too't: The Birth of Merlin, and Jan: Grease. Sarah is currently working on her Master’s in Education, and her professional goals include becoming an elementary music/theater teacher. One of her greatest treasures is to see the arts light up her students' eyes. Shelley Ohmes -- Director of Development and Communications. Shelley hails from Arlington, TX. She has performed and choreographed for multiple companies across Texas, including the Danielle Georgiou Dance Group, Stolen Shakespeare Guild, Six Flags Over Texas, and Dallas Children's Theater's national tour of The True Story of the 3 Little Pigs. She holds a Bachelor of Fine Arts in Performance from UT Arlington and plans to pursue a Masters degree in dance education. Some of Shelley's favorite theater experiences include the one-woman show Chicks by Grace McKeaney, performing fire stunts for two summers in the Palo Duro Canyon, and attending the Bayerisches Staatsballett while living in Munich, Germany. She is conversational in German, and is currently also learning Spanish and Mandarin. Shelley hopes to have the ability to perform in multiple languages one day. Eric Franklin -- Technical Director. Eric holds a Bachelor's of Fine Arts from Stephen F. Austin State University. He has worked professionally as a Technician for Royal Caribbean Ltd and served as the Production Manager, Technical Director, and Company Manager for the Dallas Children's Theater National Tour. He also taught Technical Theater and directed for Coppell High School, as well as designing lights, sound, and set for multiple CHS productions. He is currently working as an audio technician, mixing and sound designing for numerous venues in all five boroughs of New York. Catherine Restivo-- Artistic Associate. Catherine holds a BFA in Theatre from Stephen F. Austin State University; and a Professional Training Certificate from Dell’Arte International School of Physical Theatre. She studied physical ensemble-based theatre at Rose Bruford College in Sidcup, England; and Real Escuela Superior de Arte Dramático (RESAD) in Madrid, Spain. Catherine has performed, taught and worked back stage in New York, Texas, Connecticut, California, Pennsylvania, Ohio, Spain and England. 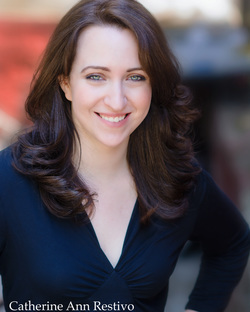 She was an Ensemble Apprentice at Touchstone Theatre and has worked with many major theatre companies including The Alley Theatre, Hartford Stage, Ensemble Studio Theatre, Main Street Theatre, Ensemble Theatre, and Huron Playhouse.